BlueAuditor is a easy-to-use program for detecting and monitoring Bluetooth devices in a wireless network. 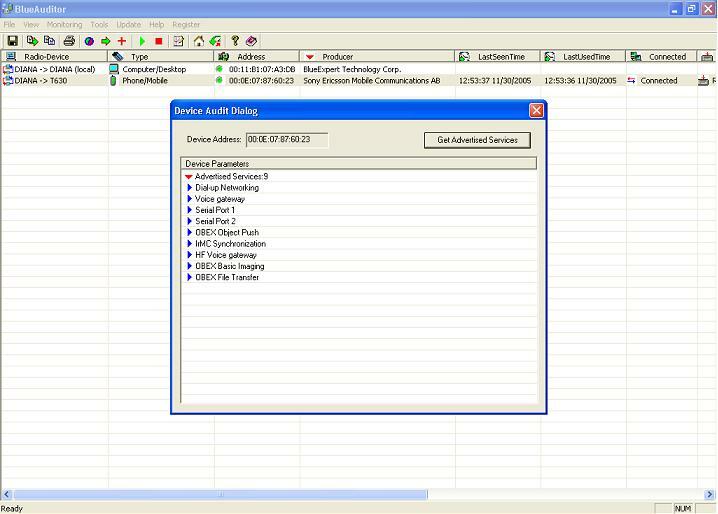 BlueAuditor can discover and track any Bluetooth device and display key information about each device being detected as well as the services device provided. BlueAuditor will enable network administrators to effectively audit their wireless networks against security vulnerabilities associated with the use of Bluetooth devices. ...... with the use of Bluetooth devices. BlueAuditor enables the user to save the data of the detected Bluetooth devices in an .xml file and supports the most Microsoft Bluetooth drivers available on the market. All the mentioned features are provided with a user friendly graphical interface. BlueAuditor only works with the Windows provided drivers. If you have purchased a new USB adapter then you should install it by simply plugging it in. Windows should automatically detect the adapter and install the appropriate drivers without you needing to install any software from a CDROM. Qweas is providing links to BlueAuditor 1.4.9 as a courtesy, and makes no representations regarding BlueAuditor or any other applications or any information related thereto. Any questions, complaints or claims regarding this application BlueAuditor 1.4.9 must be directed to the appropriate software vendor. You may click the publisher link of BlueAuditor on the top of this page to get more details about the vendor.